CJ's Thumbs Up Foundation: Marathon Update-CHICAGO! Hello friends! We apologize for not updating earlier. Not only have we been busy but we haven’t been near a regular wi-fi connection so this blog post is a little late in coming. BUT HERE IT IS! First of all, a fundraising update: the Double Marathon Challenge has raised over $300 in the last few days. Way to go and much thanks for the donations. We still have some donations coming in from Chicago folks and we will give you an update by Monday (hopefully) with totals. 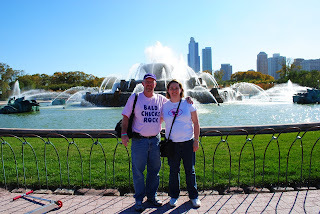 Our trip to Chicago was very stress-free. Our good friend Carolyn offered us a ride to the airport even though we had to leave our house at 4:30 AM. It was so nice to have a chauffer that early in the morning (not to mention not having to leave one of our cars in the park n’ go lot). Both flights were smooth and easy. Once we got to Chicago, we hopped on the L train and made our way downtown to find our hostess. Carolyn also hooked us up with a friend of hers who lives right down on Michigan Avenue. She is our hostess for the weekend. Her loft is just down the block from the 25 mile mark and Grant Park where the race begins and ends. Perfect! The rest of Thursday was spent resting and settling in. Mid-afternoon, we journeyed out to the ‘burbs on commuter rail to see our college friends, Mike and Rebecca. We had a great dinner with them and were more than entertained by their almost 18-month old son who is chattering like a parrot these days. Friday was a WALKING day. We walked to the Convention Center (probably about a mile or so from our place) to get the race packet and “walk the gauntlet” (as Roger likes to say) with all the vendors hocking their wares. We got lots of yummy food samples, pulled in lots of swag and met a few other charitable organizations that are fundraising through races. It was great to get in touch with these people and swap stories, business cards, and ideas. You never know where a contact like that may go. Roger wore his new BALD CHICKS ROCK shirt that came from the New Mexico cancer walk earlier this month. His sister Becky designed the shirts and they look great! Roger got lots of interesting comments and inquiries about the shirt throughout the day. You can't tell in this picture, but the back of the shirt has one of Charlotte's pics in her 'bald chicks' shirt along with the CJSTUF logo on the back. 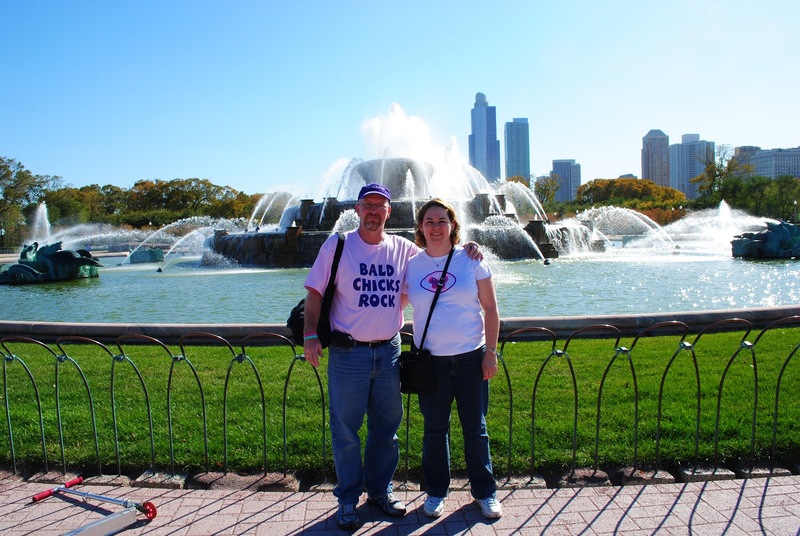 We saw one woman in Grant Park that commented on his shirt. When she saw it, she pulled off her own wig and showed off her bald head! She is not a cancer survivor but has alopecia. After our trip to the convention center, we played tourist for the afternoon, walking through Grant and Millennium Park and then down Michigan Avenue and out to Navy Pier. By the time dinner time rolled around, we had walked at least 6 miles (whew!) so we headed back towards our lodgings via bus and L train and ended up at an Irish Pub across the street from our loft for dinner. I must have been exhausted because not long after returning to the loft and changing our clothes, I was ASLEEP! So today we begin the final countdown for the Marathon. We have been invited to a matinee performance of Candide and then a carb-loading dinner for Roger with our friends. Tomorrow will begin bright and early. The race starts at 7:30 AM (Central Time); however, Roger’s corral will probably cross the start line at about 8 AM or so. If you text and want to receive text updates of Roger’s progress, you can go to http://www.chicagomarathon.com/ and click on runner tracking. Enter Roger’s bib number (26761) and updates on his progress will be sent to your cell phone. I will try to keep facebook updated as well. He is hoping to finish in about 5 hours. Have a great run, Roger! You're gonna rock it!